Description: Happy Thursday! Happy April! Here are the Drone Video of the Week Ep 6 nominees! Make sure to check out the full cuts in the links below and then VOTE for your favorite! Hiking Motivation: Best Places for 2019 is put together by our Drone Video Awards finalist HikeTheWorld. It's remarkable and inspiring and includes "the best places which should be put on every hiker/traveler bucket list for 2019." 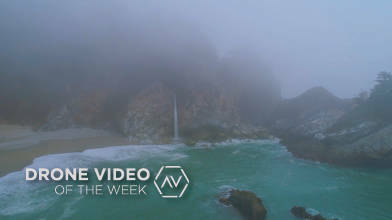 Dave Yip had "a wonderful experience on my road trip to Big Sur in a foggy day." and shared it with us in his video Adventure - Big Sur. Yes, it really does look like something in a dream. Can the Philippines be more beautiful? Laurent Paris hopes that after you see his video Philippines magic drone video, "you will go see that beautiful country because it's just fantastic." We hope you travel there also! The Art of Flight is a captivating creation from Balazs. He says "I am always working towards broadening my perspective of this beautiful world that we live and exploring locations from an entirely different point of view." We think you did just that. The world truly is a beautiful place. Our last nominee is new to AirVuz! Welcome vegardho! He used the Mavic Air and Mavic 2 Pro to showcase all the breathtaking sites in his first upload, Northwest Norway Above - Sunndalsøra | Drone 4K. How lucky is he to have Sunndalsøra as his backyard?! We love all the variety this video has to offer. CLICK HERE to vote for your favorite video. Voting runs through Sunday, April 7th at 11:59pm CDT. The winning video will be announced on Tuesday, April 9th on AirVuz.com See all five Drone Video of the Week Ep 6 nominees HERE!